Our services include mounted and unmounted equine and other animal interactive therapeutic activities. Our goal is to promote physical, occupational and emotional growth in adults and children with physical, cognitive, mental or emotional challenges and for senior citizens. Our one of a kind Minis to Me has been designed to provide animal therapy in the community as a mobile program to reach those 4 years and older who are in need and have transportation challenges. Miniature horses are a great option to build trust and befriend when large horses are intimidating especially to a small child or fragile senior. They are easier to transport, easier to handle, all while possessing a “loving and lovable” temperament. Most importantly, those who are not mobile, have severe physical challenges and are not able to ride a horse can participate and receive the many benefits from the program. Even those in wheelchairs or bedridden can interact with the Minis. Our mission is to improve the quality of life for adults and children with disabilities and seniors. What is Equine and Animal Therapy? 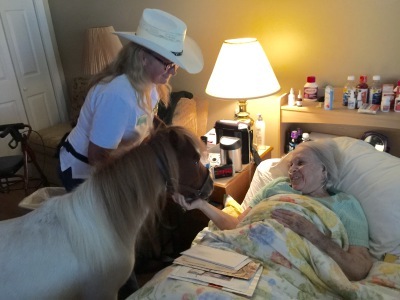 Equine and animal therapy, also known as Equine and Animal Assisted Therapy (EAAT), is a therapy that can help the individual build confidence, self- efficiency, communication, trust, perspective, social skills, impulse control, and learn boundaries. Since many animals have similar behaviors with humans, such as social and responsive behaviors, it is easy for the participants to create a connection with the horse or other animals. 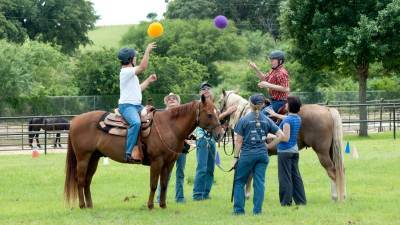 Are PATH International certified therapeutic riding instructors which means they have gone through rigorous training and education about working in the therapy environment with people with disabilities. They are held to very high safety and instruction standards. Contact us today for a no obligation evaluation!